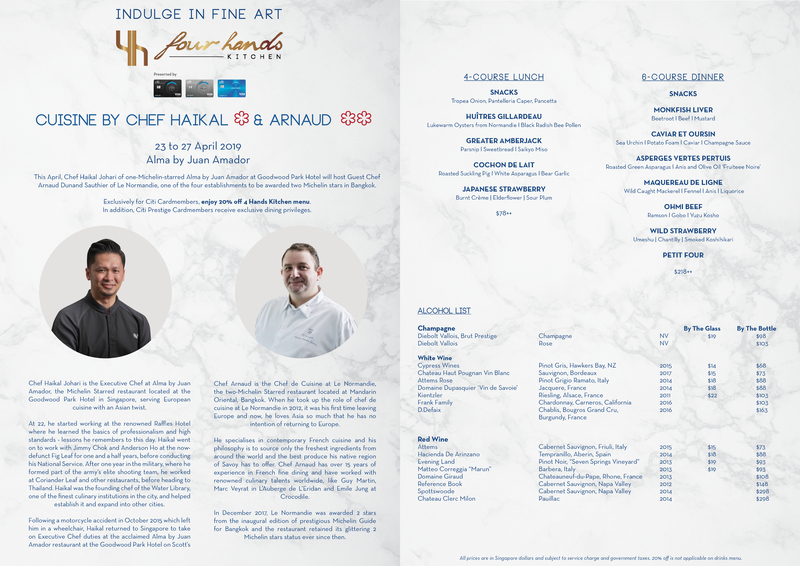 This April, Executive Chef Haikal Johari of Alma by Juan Amador will play host to Chef De Cuisine, Arnaud Dunand Sauthier of two Michelin starred Le Normandie at Mandarin Oriental, Bangkok. Be prepared for a marriage of great flavours as both chefs raises the bar as they delight all culinary explorers, bringing them to new heights of fine dining excellence. Cardmembers receive exclusive dining privileges. *Note that all dietary adjustments will be based on availability of produce as well as chef's discretion. You will receive a confirmation email for bookings made through this site. You will receive your E-Ticket(s) at your email address after checkout. After confirmation, no cancellations may be made. Prices indicated in the table below are nett.